It’s been a busy week of geeking out, so let’s take a look at what we’ve been up to! Last week saw the start of the closed alpha for Hunt Showdown and on Thursday I was one of the lucky ones to get a code to play! 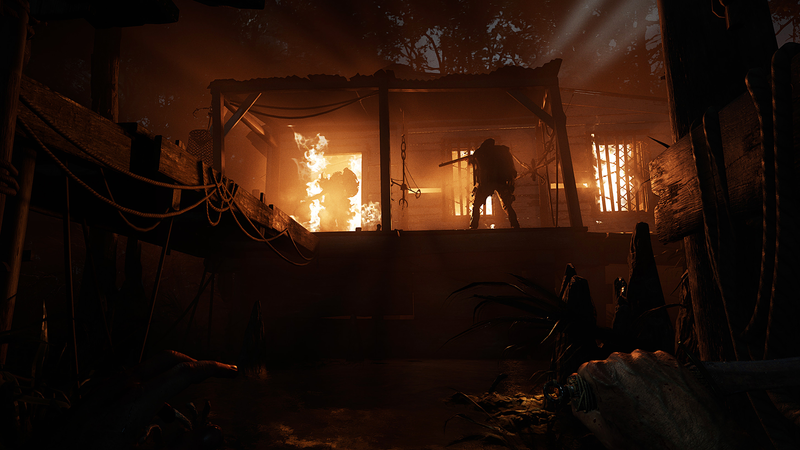 Hunt Showdown is multiplayer bounty hunting game where you can team up or go it alone in the Louisiana swamps and try to take on the horrors that lurk there. Your main objective is to hunt down one specific bounty by following clues across the map that will narrow down its location, but time is of the essence as there are other teams hoping to do the same. Along the way you will encounter other creatures of nightmarish creation. You start by hiring yourself a bounty hunter and have a few to choose from, each with their own weapons. Some are cheaper than others I’m guessing the more expensive ones start with better weapons. But you can also visit the store and buy weapons and supplies with the money you earn from bounties and killing other monsters or players. As you level up you will also gain access to perks – it will be interesting to see how these progress and how much of a difference they make as it could give players a big advantage. I’ve been following the game for quite some time as I’ve been very interested in its progress. 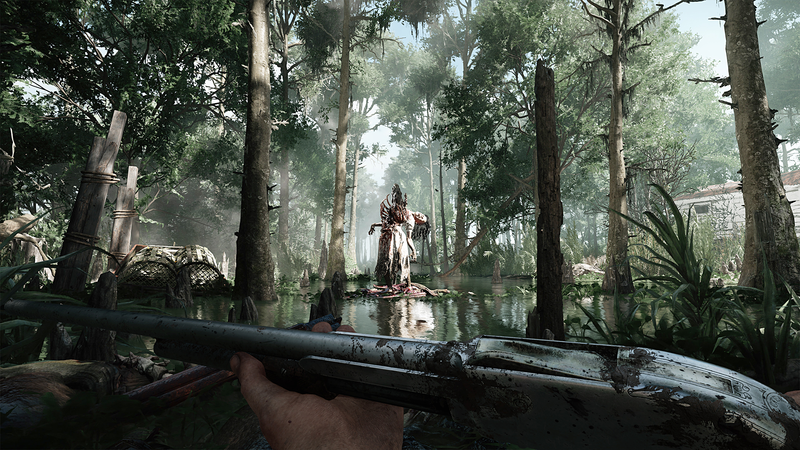 Visually the game looks pretty great – it’s from Crytek so it should look pretty good. The setting is also amazing, it’s very atmospheric, and the ‘Western’ style feel to the game really suits the setting down to a tee. The gameplay could be a bit smoother, but as it’s the alpha some kinks are to be expected. I’ve only played a few games so far where I’ve been teamed up with randoms and it was a lot of fun. I also played a game on my own and I actually didn’t find it much harder to be honest. Sure I still died, but that was because some other player rushed me with a machete whilst I was reloading. The weapons are all great to use although the aiming is a little odd – you have to hold RMB to hip aim, then hold shift to ADS, once I got used to it, it was fine though. But, they all pack a nice punch and feel pretty good fun – from what I’ve used to far. 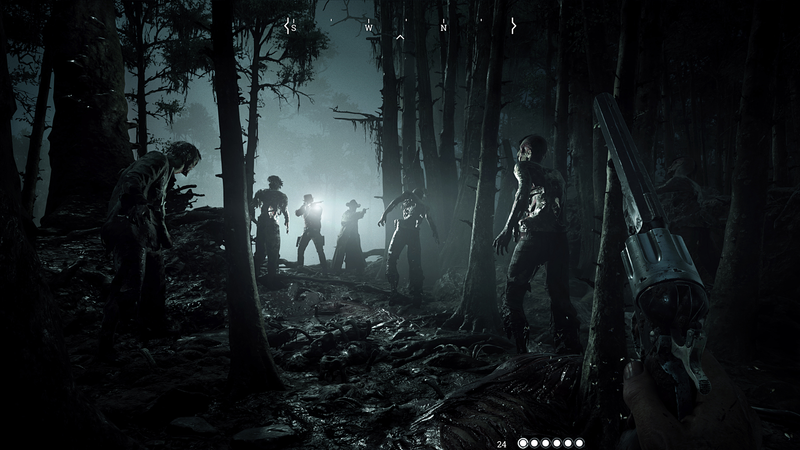 I can see a lot of promise with Hunt Showdown and if they can get the performance a little better before releasing to Early Access that would be great, but right now the game suffers from a fair bit of lag, I don’t know if that was from servers of if it was something else, but I think it needs addressing before the release it. As it stands though I would probably still buy it, but that’s because I don’t mind the odd bug or glitch and I can look past that. Tacoma was one of the games available through February’s Humble Bundle Monthly and it is a game I’ve kind of had half an eye on for a while as I’ve heard good things. 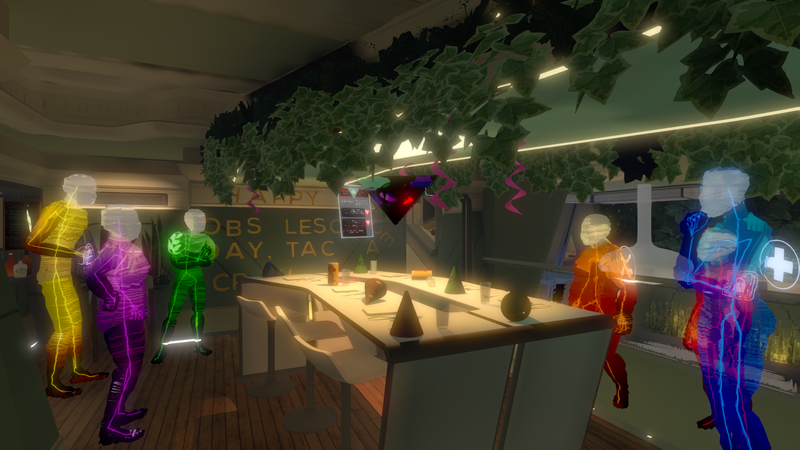 Tacoma is a narrative driven game set aboard a high tech space station in the year 2088, you’ll explore the station and discover the stories of the crew that manned it through digitally recorded 3d videos of the crews movements and conversations. Relive the story of the crew in the face of a disaster as they take damage from an asteroid and discover they only have 48 hours of oxygen left. I’d estimate that I’m almost half way through the game at almost 2 hours played – I know that it’s a fairly short game, and so far I’ve found it pretty gripping. For the most part you just wonder around listening to conversations between crew members, but the more you watch the more the relationships build, more trust issues come about and it becomes ever more tense. I don’t actually know, but I’m assuming the crew are all dead now due to the oxygen problem, which makes it a pretty dark and sombre story to play through, but it’s one that’s pretty gripping backed up with some great voice acting. Around Christmas time I jumped back on Miscreated after not playing it for a while. I basically played it for a whole day and had an absolute blast. I recorded the who session and have started making it in to a mini series on my channel. The first part is up today and the second part will be live later this week. Most of the time in survival games, people like the PVP side of it, but my session was mostly about making friends and going on random journies with them. I hope you enjoy it! I’m still playing a lot of PUBG, but I’ve been playing it solo a little more recently and have been having a lot of fun in doing so. I had a really good game recently that I put up on my YouTube Channel. Last week I was talking about Broken Age, and I was telling you all how I was enjoying it and was quite taken aback by the plot reveal or twist between the 2 playable characters. Well I continued to play through the game, adamant to make Broken Age the next game on my 2018 completed game list, but unfortunately I hit a set of puzzles in the final chapter that defeated me, made me swear a lot and give up on finishing the game. You need to wire your ‘Hexipal’ (which are the little robot helpers you see throughout the game), both characters Shay & Vella need to have their Hexipals wired in a certain way at the same point in the chapter. I was trying to figure this puzzle out for at least half a day, and It was infuriating. I’d got a notebook, drawn the symbols for the wiring onto said notebook, numbered the dots and locations of where the wiring went and then had the 2 sequence connections written down too on the note pad, but I just could not get that little Hexipal to do the correct thing. I took to the internet to see if I was simply being stupid, but alas it turned out a large portion of the Steam Community felt my rage at this stupid puzzle. Unfortunately simply watching someone else solving the puzzle and copying their wiring does not work, as the puzzle is created randomly on each play through, so I’d never have the same puzzle. So Broken Age has been uninstalled and put into the pile of PS4 games. It was a great and fun game, with some nice puzzles and as mentioned the halfway point and reveal of how the 2 main characters are linked was brilliant. But the final Hexipal puzzles ruined the flow of the game for me, and I guess I’ll now never complete Broken Age. Last night was the 52nd Super Bowl between Philadelphia Eagles and New England Patriots. Pretty sure the entire of the United States was Eagles fans last night. The New England dynasty might finally be over as New England lost as Eagles only got one sack in the whole match, but that came in a crucial part of the 4th quarter just when you thought Tom Brady was going to do what he does best. But away from the sports, there was the usual 30 second adverts that cost extortionate amounts of money. Here’s some of the highlight movie trailers that showed up during the Super Bowl.